While leadership changed hands in Combined Joint Task Force Operation Inherent Resolve operations this week, the U.S. led-coalition’s mission to defeat the Islamic State of Iraq and Syria has not, said Army Col. Ryan Dillon, the task force’s spokesman. On Sept. 5, the Army's XVIII Airborne Corps, led by Lt. Gen. Stephen J. Townsend, completed their deployment as the headquarters of CJRF-OIR and returned to home station at Fort Bragg, North Carolina, Dillon said. The mission continues under the III Corps out of Fort Hood, Texas, led by Lt. Gen. Paul E. Funk II, the colonel added. In Syria, progress is steady in isolating and defeating ISIS, he said. 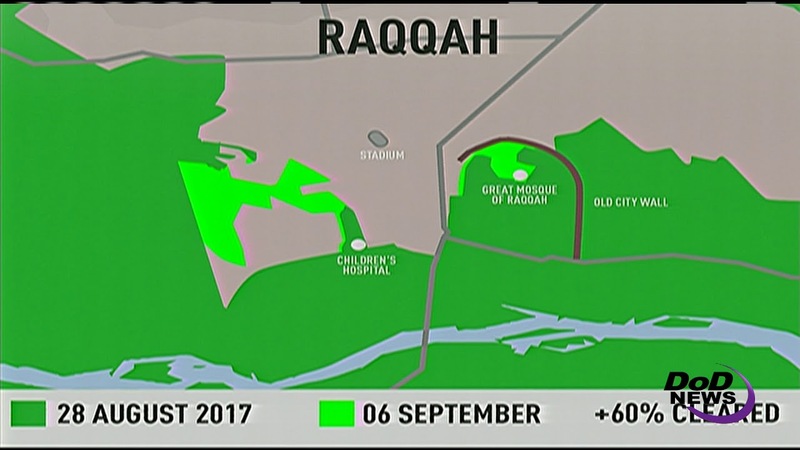 “Our partners in the Syrian Democratic Forces made significant gains in Raqqa, clearing the remaining area of the old city and reclaiming critical medical and religious infrastructure from ISIS,” Dillon said. As the SDF partners defeat ISIS militarily in the city, they are also addressing humanitarian needs, he noted. The SDF have personnel assisting in the evacuation of thousands of civilians who have been held captive by ISIS. After breaching the ancient wall 60 days ago, the SDF has made determined and steady progress in dense urban terrain as ISIS fighters struggle desperately in a futile attempt to hold on to territory in their disappearing caliphate, Dillon said. 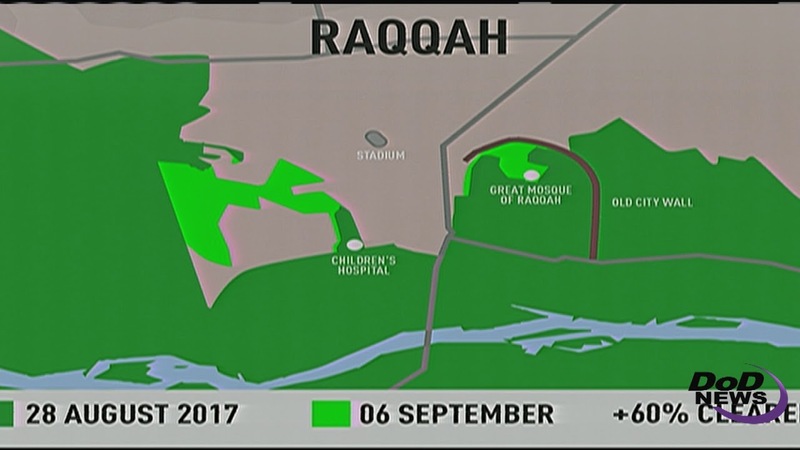 And in Raqqa, the SDF has liberated more than 60 percent of the city’s population, where the urban environment complicates the battle, the colonel said. “Our SDF partners must clear every single building, floor by floor, despite the mortal dangers of booby traps and suicidal ISIS fighters,” he said. In the central Euphrates River Valley, the coalition conducted a precision airstrike that killed the ISIS weapons research leader Abu Anas al-Shami, Sept. 4, Dillon said. “The coalition targeted and struck al-Shami as he rode a motorcycle near Mayadin, Syria. Al-Shami led ISIS's attempt to procure explosives and ISIS plans to use bombs for external terrorist acts,” the colonel said. Al-Shami also oversaw the building of improvised explosives to destroy vehicles and buildings to try and help ISIS cling to strongholds they are losing in Iraq and Syria, he said. Also on Sept. 4, the coalition killed a senior ISIS drone pilot trainer and engineer named Junaid ur Rehman, with a precision airstrike south of Mayadin in the village of Al-Ashara, Syria. “Ur Rehman was an experienced engineer,” Dillon said, adding that he was working to increase ISIS' ability to weaponize drones and to conduct aerial surveillance on the battlefield for attack plotting throughout the world. “We are witnessing the continued degradation of a morally bankrupt terrorist fighting force whose leaders are detaching more and more often from their foot soldiers,” the colonel said.